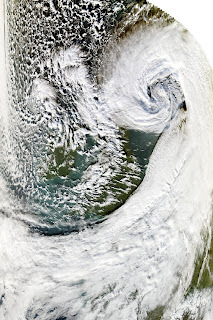 During the night of 2nd-3rd Jan 2012, gale force winds over the UK resulted in some damage to the LOFAR international station UK608, located at the Chilbolton Observatory near Winchester in Hampshire. Wind speeds at the site exceed 60 mph (97 km/h) accompanied by heavy rain, as a major low pressure system began to pass over the UK. Chilbolton staff working in the main building (about 1 mile from the array) noticed a dislodged HBA (high band antenna) cover on the morning of Jan 3rd 2012. 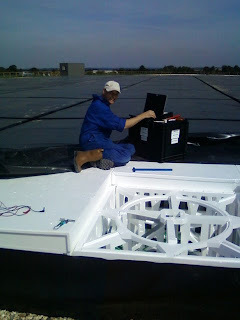 A HBA tile is made up of 16 antennas held in place by white polystyrene cells all covered by a thick black weather proof cover, making a dislodged cover dramatically visible from a distance. An image of an HBA with part of the cover removed for testing. This reveals some of the lids, plus one antenna "cell" with the lid removed. You can also see more of the structure of HBAs in our video tour of Chilbolton. Fortunately only one of the HBA tiles lost its cover, but 10 of the antenna "cells" within this tile lost their lids exposing the delicate antenna parts to heavy rain and damaging some of the internal structure. Debris was also blown all over the fields around UK608. Unfortunately the LBA (low band antenna) array fared much worse. In total thirteen of the 96 antennas have been damaged or destroyed. Two of these antennas were completely blown away (including the metal grids), and eleven have been blow down. A further four antennas have been dislodged and may be partially damaged. Dame Jocelyn Bell-Burnell poses by an LBA during the UK608 opening. For more information on LBAs see our Chilbolton video tour. Chilbolton staff members should be thanked by all of us for extraordinary effort during the ongoing severe weather yesterday (gale force winds and torrential rain) to mitigate further damage and collect debris. They have been hard at work again today further securing the damaged array, as the UK is not out of the weather yet with moderate to strong winds forecast for the next 24 hours. Work is also ongoing to assess the full extent of the damage, particularly to the LBA array, and make plans for the repairs. However the design of a LOFAR station is such that it can function at almost full efficiency with a few antennas down. So while the loss of a full HBA looks dramatic, it should only have a minor effect on the data quality in the high band. And the remaining (up to) 83 functioning LBAs (or 86% of the antennas) should also be able to make successful observations. A quick update that another 2 of the LBA antennas were damaged in the gales on the night of Jan 4th. So that's a total of 1 HBA and 15 LBAs down. But the rest of the station is up and running and sending data to the Netherlands.